As a locally owned business, all of us at Wild Birds Unlimited Nature Shop believe strongly in being active in our community and supporting local causes. Here are just a few of the many groups we support and we encourage others to become involved. Wild Birds Unlimited has donated the bird feeders located outside the Nature Center viewing windows, and provides a year-round supply of quality seed and nuts to keep those feeders busy with bird activity. We have also created a bluebird trail in the prairies, having donated 15 houses, along with the poles and raccoon baffles to keep them safe. 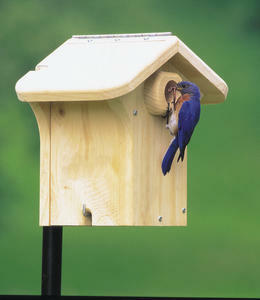 Look for the Eco-Tough birdhouses (made from recycled materials) throughout the property. Wren houses were donated for the woodlands, along with Bluebird houses for the prairie. These houses have successfully fledged many baby house wrens, bluebirds, and tree swallows and are monitored weekly by a wonderful group of volunteers. The data they collect is submitted to Cornell Lab of ornithology for part of an ongoing nesting study. LMG offers wonderful guided bird hikes on certain Saturdays in the Spring and Fall. See their web site for details. Wild Birds Unlimited compliments these groups who work together to educate and preserve our local and state habitats for birds and wildlife. We have donated multiple bird feeding stations located outside the education room at Adam's WildIife Sanctuary's visitors center, and donate all the bird foods needed to keep the feeders filled year round. To help encourage people to get involved with birds, we regularly participate in presenting educational seminars at the sanctuary. Are you a Springfield Audubon Member? Let us know. In support of Springfield Audubon Society (SAS), Wild Birds Unlimited makes a donation to SAS for each 20 lb. bag of birdseed purchased by SAS members. At checkout, be sure to remind us of your membership so we can count your contribution. SAS members can also receive 10% off regularly-priced, non-food merchandise, or may choose to have WBU donate that 10% to SAS. Not currently a member? You can be! Applications available at Wild Birds Unlimited, or download one from the Springfield Audubon website. Each year we help raise funds for homeless animals by being a host location for APL's Have-a-Heart fund drive. This wonderful group of volunteers helps the animals at our local, government run shelter. They walk dogs, play with cats, and arrange off-site adoptions that would not be possible with the limited funding of the shelter itself. They even helped us find Lewis. Serving smaller communities to our south, this is another fine group that is helping pets and pet owners. Store owner, Wade Kammin, is a volunteer puppy raiser for this wonderful group which trains assistance dogs for people with disabilities. Wild Birds Unlimited has donated and installed two complete feeding stations and an assortment of foods to LLCC, in coordination with Tony Rothering, the professor of biology and 2008 Pearson Master Teacher who generously donated his $5000 award back to LLCC for construction of two bird viewing blinds. One feeding station is located between the woods and prairie north of Menard Hall, with the second located near the creek and bridge west of Sangamon Hall. Chris Young of the State Journal-Register wrote a very nice article describing the installation day, see article here. The viewing areas are open to the public. Please stop by and show you support while enjoying the birds! Chris Izatt, LLCC student photographer, took these photos of Goldfinches (in winter plumage) and House Finches just days after the feeders were installed. Each year Wild Birds Unlimited provides donations to many local organizations that benefit the greater Springfield community.